> You can say all you want about how bad the Brewers’ bullpen is. It leads baseball in blown saves. I guess it hasn’t left Ron Roenicke with many options, but lately one option has actually emerged. It’s Jim Henderson, the 29-year old Canadian who has spent 10 years in the Minors before finally getting his chance at the Major League level. And he’s been producing. Coming into today, he had a 2.57 ERA (should be 1.29), and appeared to have the closer’s role locked down. But, Roenicke did what he’s been doing FAR too much this season; try and give the struggling relievers second chances. And it cost starter Mark Rogers. The Brewers lost to the Astros today, 4-3, courtesy of John Axford’s eighth blown save, and his seventh loss. It was going fine early. In the first inning, Ryan Braun drove in Nyjer Morgan, who had reached on a dropped strike three. In the second inning, Astros starter Bud Norris threw a wild pitch with Jean Segura batting, which allowed Rickie Weeks to score from third, giving the Brewers an early 2-0 lead. The Astros didn’t get on the board until the fifth inning on Carlos Corporan’s RBI single. 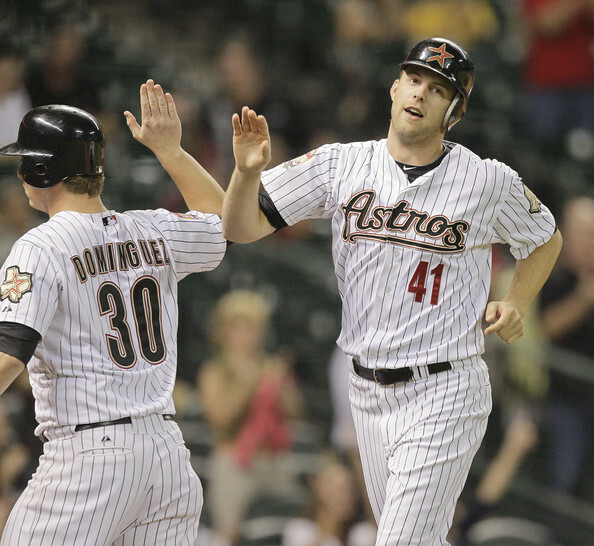 Up until that inning, Rogers had held the Astros hitless through four innings. This was by far his best outing as a big leaguer, as he went seven innings while giving up a run on three hits (all in the fifth inning). He walked two and struck out eight. The Brewers tacked on one more in the seventh on Segura’s RBI single. So Roenicke must have thought it was 2011 today, because he used Francisco Rodriguez in the eighth, and Axford in the ninth. K-Rod gave up a home run to Corporan to cut the lead to 3-2, and from there retired the side in order. Then Axford came in, and disaster once again struck. Axford walked Brett Wallace to start the inning, who was pinch-run for by Tyler Greene. But, Greene advanced all the way to third base because of a wild pitch. Steve Pearce promptly tied the game with an RBI single and reached second base because of an error by center fielder Carlos Gomez. Scott Moore then drilled an Axford pitch to very deep center field (a few feet up Tal’s Hill), but Gomez managed to make the play, with Pearce tagging to third base. Brian Bogusevic dealt the finishing blow with a walk-off RBI single. By the way, some people on Twitter were trying to blame Axford’s wild pitch on catcher Jonathan Lucroy. I’ll admit he didn’t make the best effort, but there’s honestly no point attempting to defend the bullpen anymore. It is what it is. > I can’t explain everything, because I’d be attempting to figure out what goes on in the mind of Roenicke. I can’t do that, nor would I ever want to. But I can say this. The Brewers have found another closer for the time being, that reliever being Henderson. But that’s useless if Roenicke continues to go back to the reliever who have failed the Brewers time and time again. By the way- I’m not trying to come down on Axford, at least not directly. Obviously I have to blame him for the loss, considering he took the loss. But I’ve tried to stay away from mocking players directly lately, because I recently learned a lesson, that lesson being to not say anything online (or anywhere else) that you wouldn’t say to someone in person. I made that mistake three years ago on my old Twitter account, and I’ve made it a few times on my current account and even here on BWI. But I’ve tried to imply that rule to myself a lot more often lately, because I recently ran into Axford in person. All I could do was ask for a picture. Would I ever tell him “quit blowing saves” or “you’re horrible?” Heck no. There are plenty of people who do that on Twitter, and I don’t want to one of those people. But I’m a writer, so I have to at least be critical about it. But I’m not afraid to come down on Roenicke, because it’s gotten to the point where I would probably blow up at him in person. Anyway, I kind of rode off topic there, but I felt the need to get that out there. > I was going to talk about the possibility of Mike Fiers (and other pitches) getting shut down before the end of the year, but I think I’m going to save that for another day. That topic requires its own article, because I’d also need to go into my opinion of that, pitch count, and so on. > Shaun Marcum made his first rehab start today for the Timber Rattlers (Single-A). He went three innings and threw 36 pitches, 28 for strikes. He gave up a solo home run, but was otherwise solid. He didn’t walk a batter and struck out three. Marcum was only scheduled to throw 35-40 pitches, so the low innings and pitch count were probably because he hadn’t thrown to live hitters in awhile. Marcum hopes to return to the Brewers by their home series against the Cubs on August 20th. > The innings limit suggested by Roenicke counts as news, I guess. > The bullpen is awful. You don’t need the numbers to tell you that anymore. > Weeks went 3-for-4 with a career-high three doubles today. > Gomez went 0-for-4 with three strikeouts, all against Norris. > Segura got his first hit that left the infield, and his first hit that drove in a run. > Rogers’ chance at his first career win was once again blown by the bullpen. > I’ve never been one to come down on umpires. I understand they have one of the toughest jobs in baseball. Just like players make mistakes, umpires will every so often as well. Some people would disagree with this, but, in my opinion, umpires’ mistakes are usually by accident. Say there’s a bang-bang play at first base. Sometimes the naked eye just can’t see whether or not the runner was safe, without instant replay (but that’s another story). Since MLB refuses to expand instant replay, we have to accept the fact that umpires are human and will miss calls like that every now and then. Those are the type of umpire mistakes I can accept. But, there was an incident last night where an umpire became selfish, and an innocent player was punished because of it. Those are the types of intentional mistakes that make me hate umpires. The incident I’m referring to occurred in last night’s Nationals-Astros game. The first part of it happened in the fourth inning. Bryce Harper was at the plate, and Armando Galarraga (who, ironically, has one of the most famous run-ins with an ump of all time) was on the mound. Harper had an 0-2 count, and Galarraga threw a fastball that ran a bit outside. Catcher Carlos Corporan sort of framed the ball, but not enough to make it a strike. But, home plate umpire Angel Hernandez (heard that name before?) called Harper out. Harper didn’t explode about the strike call, but he let Hernandez know that he thought it was outside. Hernandez appeared to take it well, and didn’t eject Harper. All seemed well until Harper’s next at-bat in the sixth inning. The Nats had the bases loaded with two outs against reliever Chuckie Fick, and Harper was in a favorable 3-1 count. So, Fick, a left-hander, threw a cutter to the also left-handed Harper that appeared to run outside- there was no question about this one. Harper waited for a strike call, didn’t hear it, and started to run to first base. But, after Harper took a few steps out of the batter’s box, Hernandez called a strike. You could see the discontent on Harper’s face as he walked back to the batter’s box. On the next pitch, Fick threw a cutter in the exact same place. Harper once again started to run to first base, but Hernandez called that pitch a strike as well. Harper slammed his bat in anger, but made no gesture towards Hernandez, so he wasn’t ejected. Still, this shows that Hernandez held a grudge against Harper from the fourth inning. He also probably wanted to see if he could break Harper and make him retaliate. Harper, who is just 19, handled it perfectly, although I wouldn’t have blamed him one bit for barking at Hernandez. The point is that some umpires aren’t even doing their job anymore. They think fans come to the games to see them, which isn’t at all the case. MLB claims that they’re evaluating their umpires, but that is in no way true. If they actually were, guys like Hernandez, Joe West, Bob Davidson, and so on would be on the unemployment line right now. > The Brewers don’t play today, which is why I decided to put up an opinionated article. They start a three-game series with the Astros in Houston tomorrow. > Shaun Marcum’s first rehab start for the Timber Rattlers was rained out today. Instead, he’ll make his scheduled start tomorrow at 5:35 PM CT in the first game of a double-header. > I learned from EM this morning that the Cardinals traded the one-time highly-touted prospect Tyler Greene to the Astros for a player to be named later and/or cash considerations. This comes the night after Greene was booed by the “best fans in baseball” because he made an error that would have cost the Cards the game at the time. They went on to lose to the Giants 15-0, which wasn’t all Greene’s fault. But the game could have gone differently had he not made the error. Anyway, Cards fans have always had mixed feelings about Greene, but the past few years they’ve found ways to blame him for everything. So I’m guessing the game last night was the last straw for Greene, and he requested a trade following it. > The Orioles called up their top prospect today, shortstop Manny Machado. There was some speculation that the O’s, when they were in the running for Zack Greinke, would need to give him up, but they weren’t willing to do that. Anyway, it’ll be interesting to see what they do with former Brewer JJ Hardy, who currently mans the starting shortstop position for the Orioles. Machado is starting at third base tonight, but his natural position is shortstop, so I can’t imagine they’d keep playing him at third (since Chris Davis and Mark Reynolds also need positions). I would say this is a perfect time for the Brewers to claim Hardy off waivers and use him as a utilityman, but Hardy has been one of the Orioles’ best power hitters the past two years, so they probably wouldn’t give him up in the middle of a pennant race. Now we see the effect of the two Wild Cards be added to late (if they should have been added at all). Everything is jam-packed at the beginning of the postseason. That causes the teams with worse records to have home field advantage in the first round due to time/travel issues. Sort of defeats the point of home field advantage, no? Everything returns to normal in the second round, however. MLB Network is also going to be broadcasting a few DS games this fall for the first time in their history. Probably none of this will apply to the Brewers, though. > I updated the about page here at BWI. I made that page over a year ago when I first started BWI, so it was in desperate need of some updating. On another note regarding the site, I’ve decided that I’m probably going to change the theme again. At first I liked the new theme, but lately it’s felt too busy and crowded. It makes the style of article I write feel messy and unorganized, and there are a ton of useless widgets that the theme doesn’t let me get rid of. > Randy Wolf threw a 49 MPH eephus/curveball in yesterday’s game against the Reds. I think that’s a record low, even for him. You can watch the slow ball here. > Anyway, that’s about it. I’ll be back tomorrow with more Brewers coverage.